Ely Folk Festival 2018; Friday evening; visitors settling in for a weekend of great music; … but on Campsite 3, things were really buzzing! 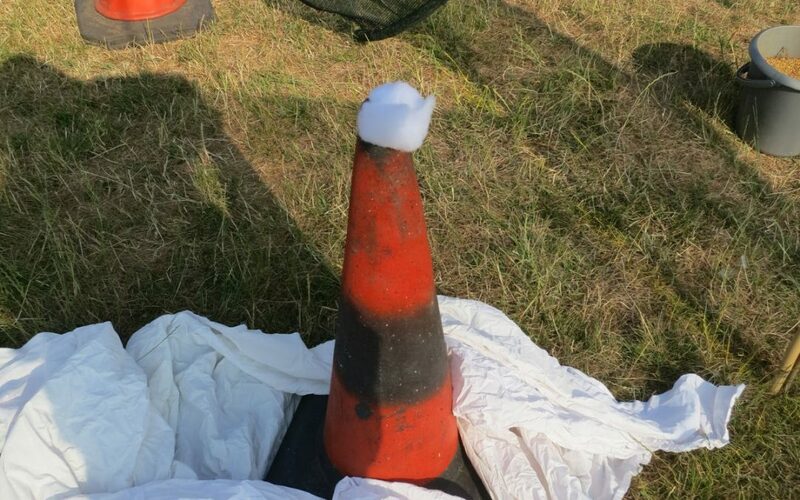 A swarm of bees had decided to make heir home in one of the traffic cones used as a marker on the campsite. While the cone was safely fenced off, the question was…what to do next? Luckily, Ely Folk Club organiser Ruth Bramley and her husband who are local beekeepers were on the festival site, and on Saturday morning, suitably attired, Ruth and Robert plugged the traffic cone and carefully removed it and its occupants to their home in a local village. Once there the cone was placed on top of an existing hive thought to have lost its queen, the plug removed from the top of the cone, and the bees left to adjust to their new home. The follow day, the bees were gently shaken from the cone into the hive where they appear to have settled. A happy ending for all concerned – thanks to Ruth and Robert Bramley.